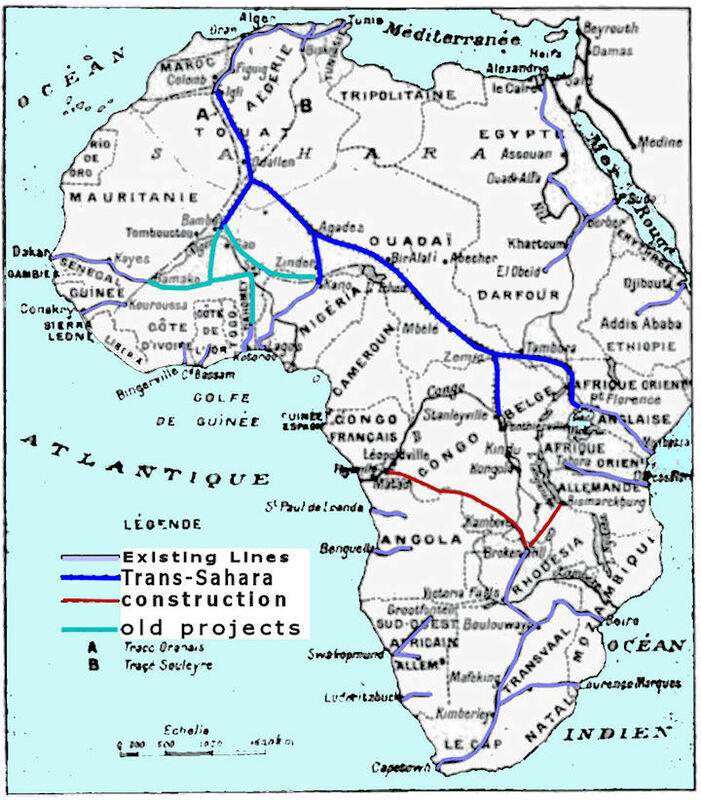 Jean-Claude Faur, "La mise en valeur ferroviaire de l'AOF (1880-1939)"
Trans-Saharan Railway was a project to build a rail line south through Algeria to sub-Saharan Africa. It would have been the French counterpart to the British Cape-to-Cairo railroad. First proposed in the 1870s, it was seriously considered in the early 1900s, and was the focus of a Parliamentary study in 1928. A line was built from Oran south to Colomb-Bechar in the interior of Algeria, and another north from Dakar to Bamako in Mali. In 1941, the Vichy government laid a few miles of track, after which no more was heard of the project. The southern portions of the French African empire were practically isolated, the vast interior regions presenting an almost insurmountable barrier between them and Algiers, so that in case of a war with a strong naval power like England, they would be in great danger. But Algiers was comparatively near France and possesses, moreover, its own means of defence, so that if it and the other parts of French Africa could be firmly knit together by a railroad there would be little to fear from an outside foe. 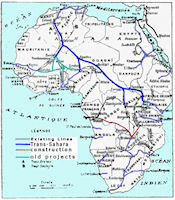 Besides the strategic reasons in favor of a Trans-Sahara railroad, there were political and economic ones as well. Such a road would bring the different parts of the country into touch with one another and would greatly facilitate their economic conquest. On 13 January 1873 Paul Solleilet presented a project for a trans-Saharan railroad to the Ministre des Communications et Colonies. And on 26 April 1879 Armand Duponchel published Le Chemin de Fer Transsaharien. He expected the trans-Saharan railroad to cost 1.6 million francs per kilometer to build. On 12 July 1879 Freycinet, Ministre des Travaux Publiques, created a "commission supérieure" to study the Chemin de Fer Trans- Saharrien, and on 29 December 1879 the French goverenment appropriated 600,000 francs for four trans-Saharan study missions. As far back as 1880, some preliminary surveys to the south of Algiers were made by exploring parties. But on 07 February 1880 Lt. Col. Flatters, Capt. Mason and 19 soldiers were killed in the region of l'Air (Algerian Sahara), and on 10 February 1880 Lt. Dianous was killed and the rest of Flatter's mission decimated. The disastrous end of the expedition commanded by Colonel Flatters, which was ambushed and nearly exterminated by the Touaregs, put a stop to this work for many years. A discovery of much archeological interest was made in the Algerian Sahara. M. Tarry, who had been carrying on work in connection with the proposed TransSahara Railroad, having noticed a mound of sand in the neighborhood of Wargal, had the sand dug up, and discovered the top of a spherioal dome. This naturally aroused his interest, and getting his Arabs to dig still deeper, he found underneath the dome a square tower, then a platform of masonry, and finally a complete mosque. Continuing the excavations, M. Tarry soon unearthed seven houses in perfect preservation, and came upon a subterranean watercourse. It was well-known that the Sahara was at one time much more populous than it is now, and its trade much more extensive, but no one seemed to have supposed that any cities had been buried under its sands, at least so reoently as since the introduction of Mohammedism. Nearly the whole of the vast space of the regions which lay between Algeria and Morocco on the north, and Lake Tchad and the Niger on the south was desert, and most of it hopeless and irreclaimable desert; a desert in which oases and even wells of half-bitter water were so few that camel caravans did not attempt to cross it. It was inhabited by tribes mostly nomadic, some akin to the Berbers of Morocco and Algeria, some belonging to the Touaregs, probably itself a branch of the Berber stock. They were few in number for so huge a space, perhaps not two hundred thousand in all, but they were fierce fighters, the Touaregs especially. They lived for and by plunder, they were easily accessible to the influence of Mussulman preachers. The trade of these regions was insignificant, and what there was of it would come out much more cheaply from Senegal than by caravans across the desert. There was a little gum; there were ostrich feathers; there may be minerals. All these were better sent to Europe by sea; and by sea also must European goods come in. 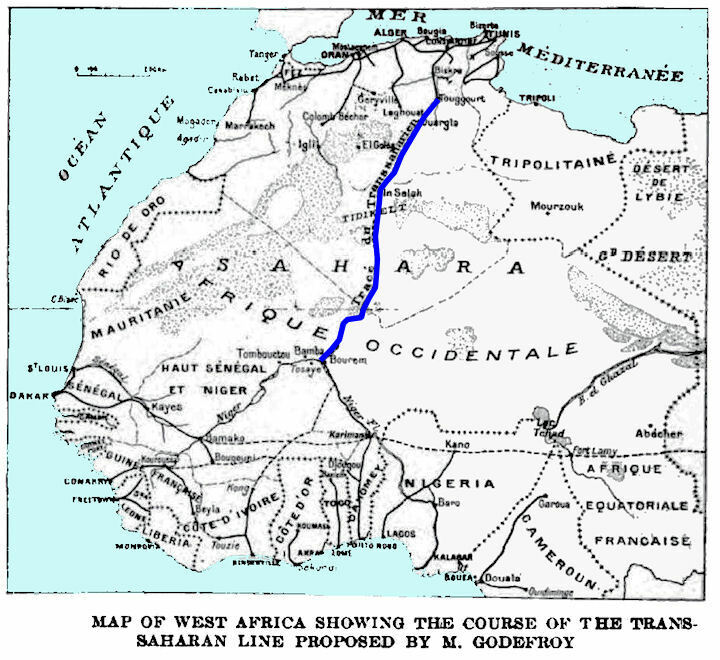 Accordingly, apart altogether from the engineering difficulties, many rejected the notion of a trans-Sahara railroad, because its expense would be utterly disproportionate to any traffic it could carry. Troops, also, were better sent in by sea, though in fact France policed these countries and conducts her punitive expeditions by native troops, raised on the spot and led by French officers. On the western side of the African continent France possessed the old colony of Senegal or Senegambia, the Rivieres du Sud, which was detached from Senegal in the beginning of 1890, the French Soudan, the settlements on the Guinea coast, and the Gabun and French Congo territories. 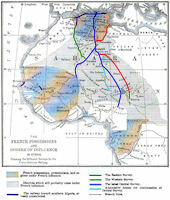 The regions over which the authority of France had in some degree been established were about 450,000 square miles. If French dominion was to be established on the shore of Lake Chad it could not wait for the building of the Trans-Sahara Railroad, which will run through 1,500 miles of desert country and traverse the land of the hostile Tuaregs, who were fanatical and irreconcilable foes of Christianity. In the winter of 1890~'91 nine expeditions set out from various points on the west coast for Lake Chad. The interior, behind the French, English, and German possessions, from the Congo to Lake Chad, was believed to be one of the most desirable parts of Africa, and its situation was such that the first of the three countries participating in the race for Lake Chad that succeeded in concluding treaties with the native chiefs could round off its dominions by annexing contiguous districts, and thus cut off the others from the central part of the continent. 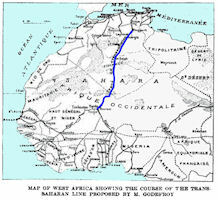 The aim of the French was to annex the whole basin of the Shari, including Bornu and Baghirmi, and extend the Trans-Sahara railroad to Brazzaville by way of the Mobangi river. The western line, explored by MM. Manger and Fousset, which started from the terminus of the Oran Railroad at Ain-Sefra, Algeria, and ran by way of Insalah to Timbuctoo, following as nearly as possible the line of the oases. A branch to Bouroum, with a possible extension to Lake Tchad, wss proposed. The distance was 1,240 miles to Timbuctoo; the branch to Bouroum is 435 miles. The central line, advocated by General Philebert and M. Roland, which started from the East Algerian Railroad at Biskra, ran through Onargla, Timassinin, and Amguid, and divided at Haggar, one branoh running to Bouroum and the other to Lake Tchad. The length was 1,020 miles to Bouroum; the branch to Lake Tchad 620 miles. The eastern line, starting from Gabes, running through Ghadames and joining the central line at a point about 330 miles from the starting point. A line starting from Cape Nun had been proposed, and also one from the extreme west of Algeria, but these were not seriously advocated. In connection with all the lines a road from the port of St. Louis, on the west coast, through Timbuctoo and Bouroum to Kouka on Lake Tchad, is proposed. The choice of the commission would be influenced by political and military considerations. Thus for the western line the occupation of Insalah would require a serious campaign, while the adoption of the eastern line would involve difficulties with Tripoli. On the central line it would be necessary to establish small colonies at a few points, with military posts at Timassinin and Amguid; the latter was an important commercial point and a central post from which the Touareg tribes could be controlled. For these reasons the central line was recommended. It was originally proposed to build a narrow gauge line on the Decauville system, but a meter-gauge road, with 45 pound rails, was recommended. The cost was estimated at a low figure, about $16,000 per mile, as no large bridges or expensive works would be needed.